Once a month (and two months, twice) I will be featuring one of my co-hosts for the Finish Along so you can get to know them better. 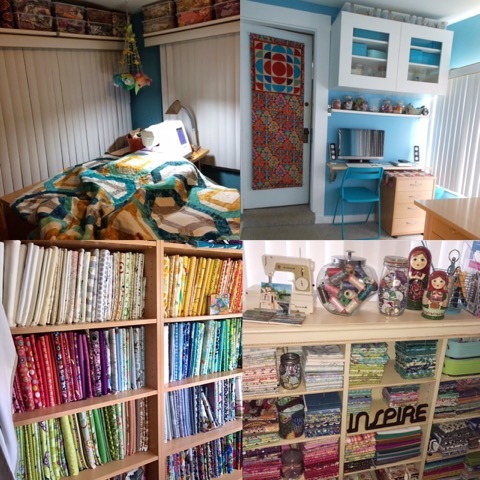 This month is Karen from Capitola Quilter and I'll wrap up here so you can read about her life directly from her! Enjoy! Hi there! 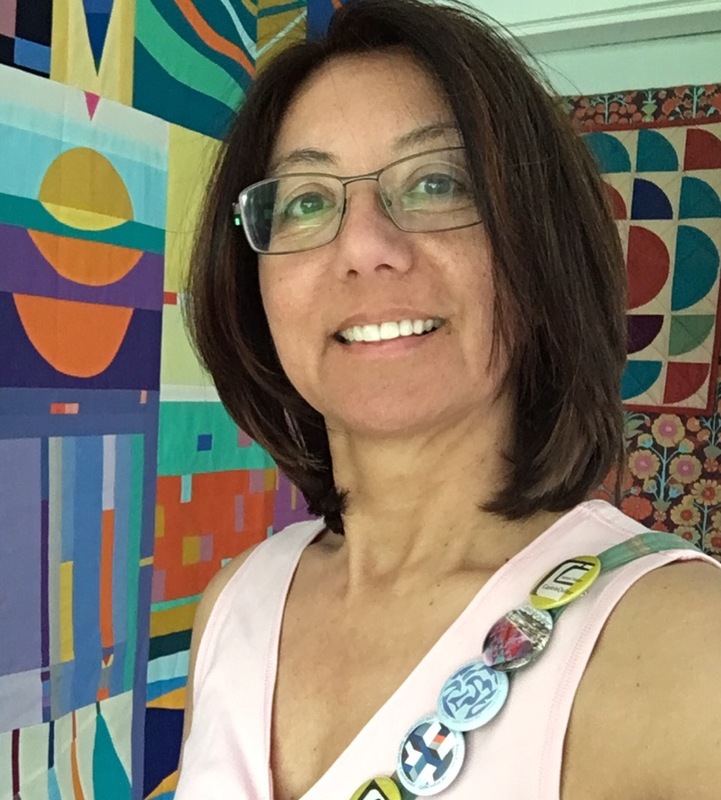 I'm Karen and blog at CapitolaQuilter . I've been participating since the beginning of Finish-A-Long and am honored to have joined in as one of the International Hosts this year. It's hard to believe we are already wrapping up 2017. 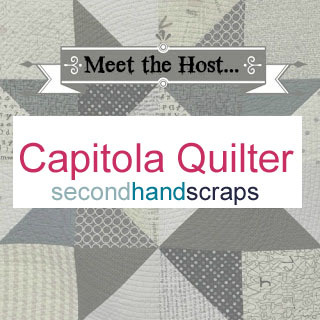 Have you enjoyed reading the FAL Meet the Host monthly guest blogger posts? Well, now it's my turn to to be featured in the series! Here goes a picture filled post starting with most importantly, my beautiful family. I am married to a wonderful guy and we have two grown boys. We are incredibly proud of the men they have become and adore the women they have chosen to spend their lives with. 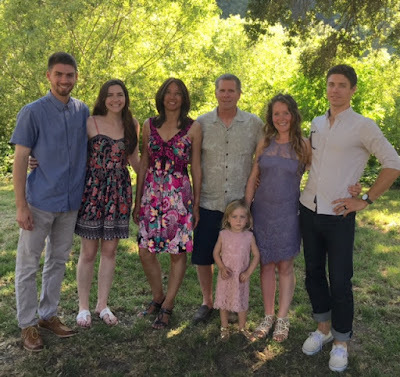 Enjoying time with our granddaughter and watching her reach milestones that we remember when our kids were young like it was yesterday and yet a lifetime ago is quite the mind game. Look how cute and little they were!!! My oversized glasses and shoulder pads date our family portrait and the "Big Hair-Skinny Tie" picture was the perfect share for my first ever swap called I heart the 80's a Flickr group. 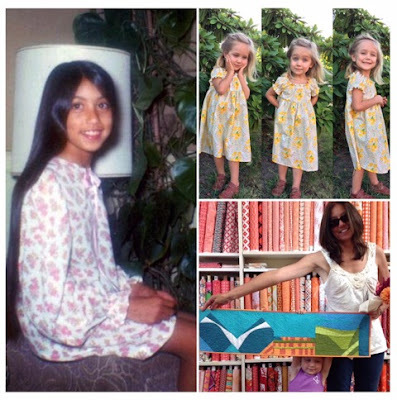 I wish I still had that hand-dyed silk dress although in reality, we prefer jeans and a t-shirt. This summer marks our 35th anniversary. In 2002 we adopted two German Shorthair pointers. Always underfoot, Dottie's trick was to step on my foot pedal (until I upgraded my sewing machine with a start/stop button) and innocently walk in the way of photos. Chase perfected the skill of lying on a quilt if I glanced away - for a minute - while basting. Sadly, we recently lost them both to sudden illness after long full lives and have no animals at the moment. Pets are considered family members to us and Hubby wants a puppy but I am not ready. 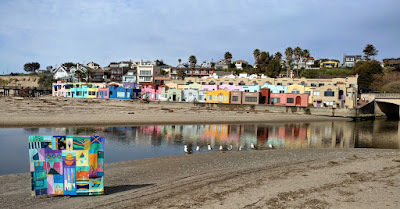 Frequently mistaken for "Capitol, a Quilter" or "capital A quilter" , my blog name is easily misunderstood if you don't happen to be familiar with the small town on the coast of California USA where I live, Capitola. Spanning less than 2 square mile with a population of about 10K, it isn't a big city but is rich in history and a constant source of inspiration. Although our house is not one of the big beautiful oceanfront ones you see in the picturesque backdrops when I take my quilts on a photoshoot, we're still pretty lucky to be able to walk to the beach and enjoy mild weather. 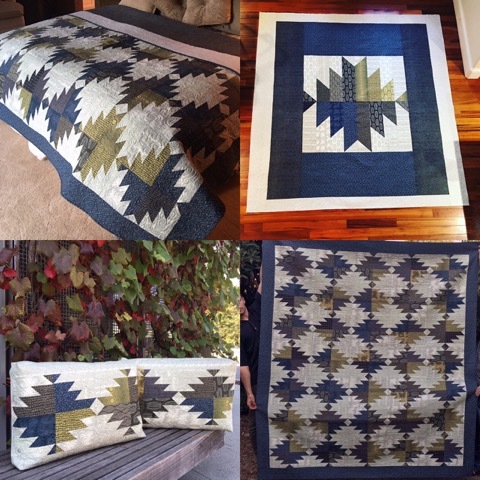 Thanks for indulging me - now on to the QUILTS! 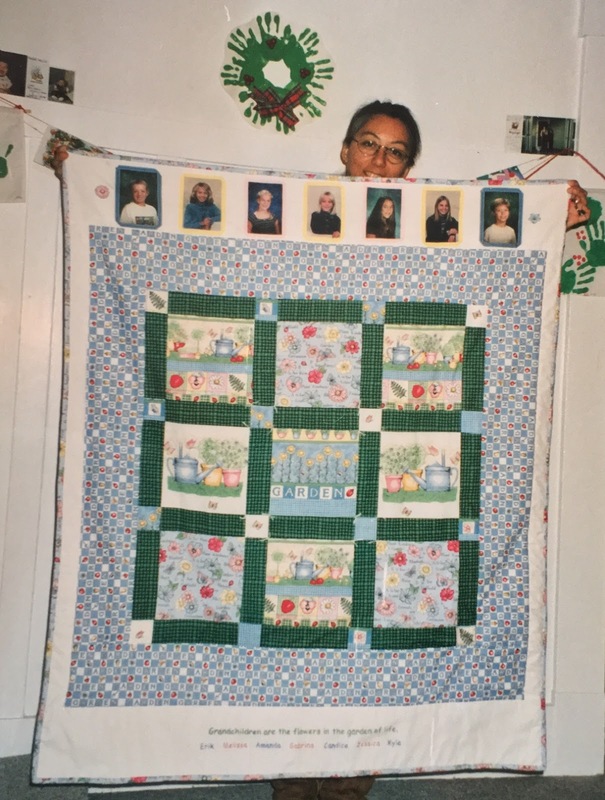 Among the first quilts I made was a gift for my mother-in-law that included a picture of her seven grandkids. It is sweet with coordinating prints, fussy cornerstones, sashing and a border. Image transfer was high-tech at the time but peeling their faces off to iron down was totally creepy. Thank goodness Spoonflower came along! My Scrappy Maximalist style had a kickstart when my friends brought fabric to a surprise Quilt-themed birthday party in my honor. The assortment received did NOT go together so I used black and white with uniform shapes to bring order and incorporated quote blocks. It is one of my most sentimental quilts and the beginning of my desire to create original works. Following patterns from books, I made these wedding quilts out of batiks, traditional and modern stash. 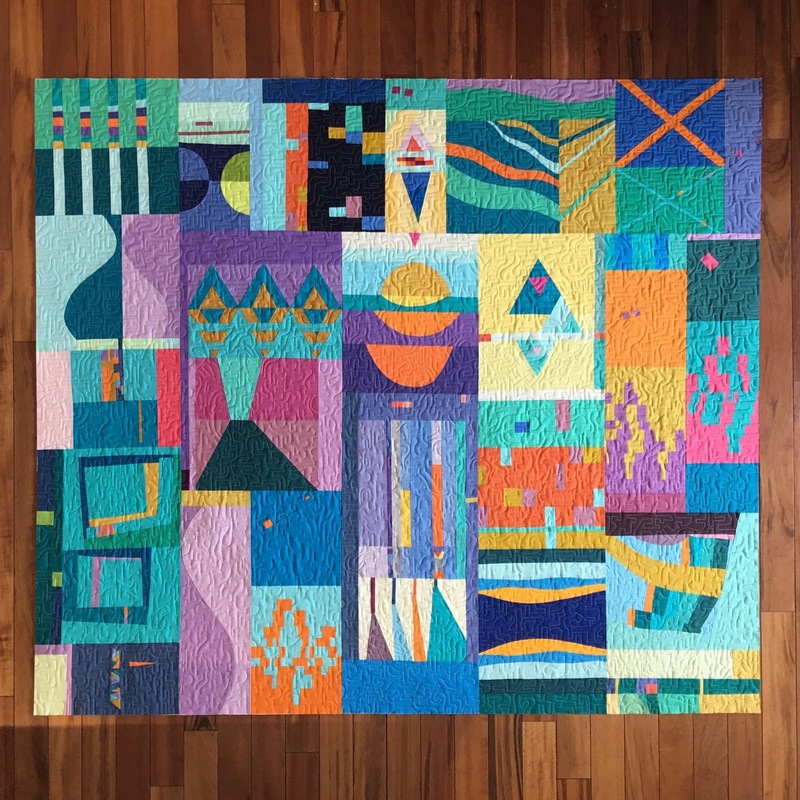 I had the chance to meet Anita Grossman Solomon at Quilt Festival Houston 2014 and see her Old Italian Block quilt in the exhibit. I subtitled my blog SecondHandScraps because I eagerly accept leftovers from friends who know my reputation for scrappiness. 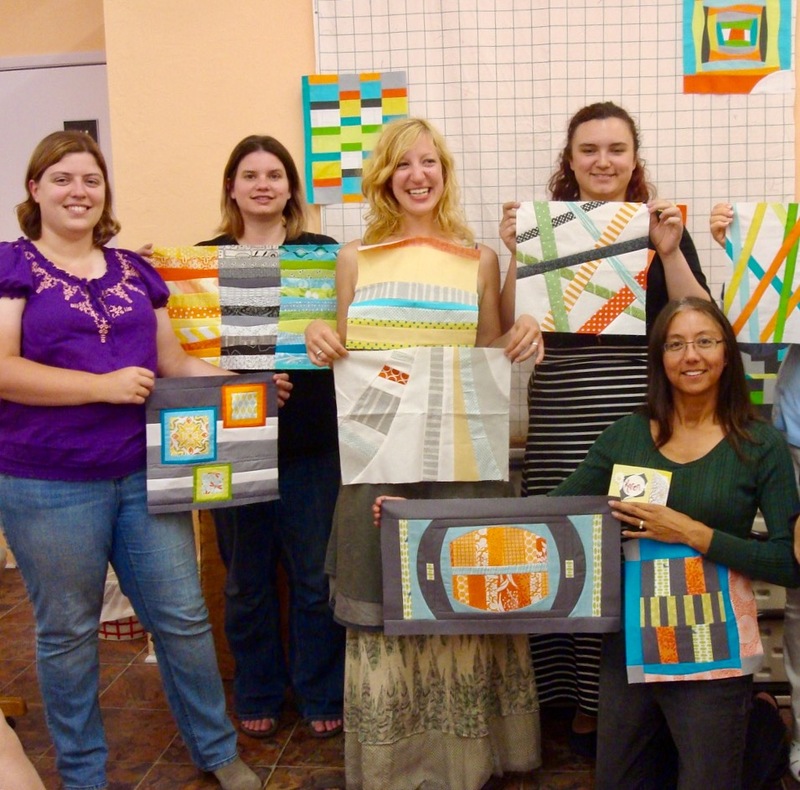 In 2013 local quilt store SueDee's featured my quilts on display in a solo show. Using the MoStash and Friends+Fabric =AMSB bee blocks that I received and adding my own enlarged blocks, the Giant xPlus was a hit and is what I keep on our bed. 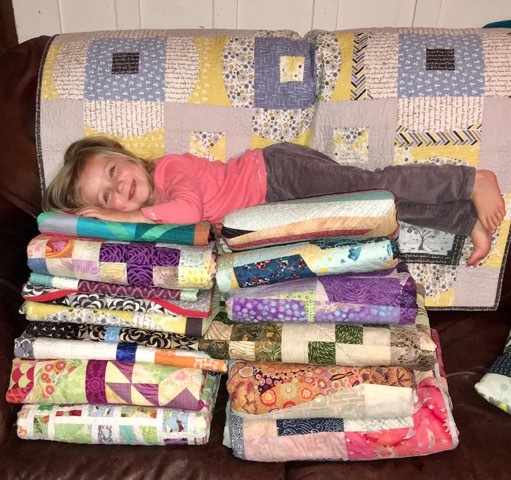 It didn't seem like an ambitious task when I set out to make each of my nieces, nephews and my own kids a 21st Birthday quilt. I stayed on track until the final three and thankfully all twelve are finally delivered. 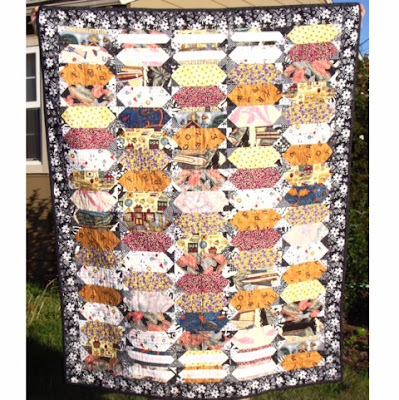 Among the tardy is this Full size quilt that rolled over from quarter to quarter on my FAL list frequently. I included a jumbo delectable mountain for the backing and two matching shams. Quilting came into my life as an adult but I grew up wearing handmade and learned to sew clothes in 4-H as a kid excelling in HomeEc in Jr. High and High School. Somewhere along the way I misplaced the confidence and skills and have had little success making myself garments. I've dabbled with clothes for my granddaughter since she's much easier to please and fit than I am. Hart's Fabric, a family owned independent brick and mortar fabric store since 1969 (a rarity these days) is still the same place I go to shop. 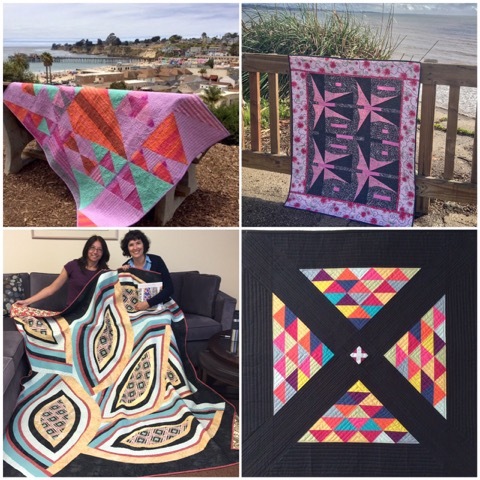 My improv seagull, poppy field and mountains design was chosen for their 2016 Row by Row Experience pattern. 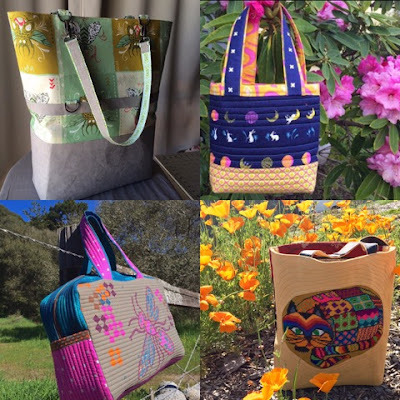 Bags are quick and rewarding makes. I enjoy browsing thrift stores for handwork and feel compelled to rescue the abandoned treasures like the patchwork cat needlework used in The Wasted Swap tote (lower right). Most of what I make now are original or modified designs rather than from patterns. 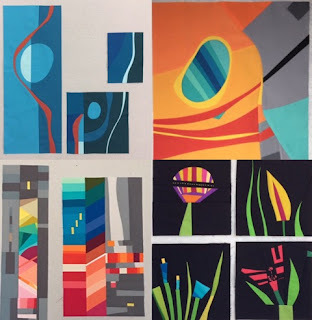 Perspective was designed using Play Crafts tool Equal, made in a whirlwind 10 days and displayed at Hart's to show off the Loominous fabric line. 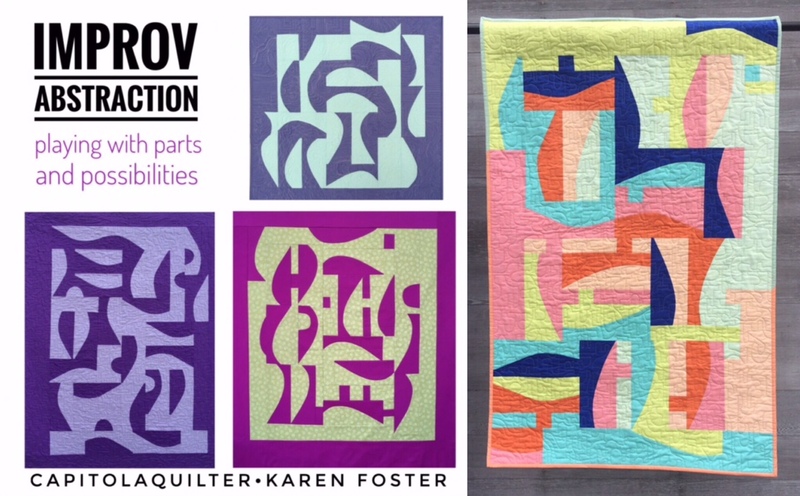 An edgy improv butterfly seemed fitting use of the Sweet Rebellion fabric line for Ink & Arrow's blog hop. Goats Askew pushed a lot of technical boundaries. I loved being one of the Score for Bias Strip Petals testers and part of Sherri Lynn Wood's gallery here even though it was not published in her book. I've taken two workshops with her and got to show and tell in person at the last one. 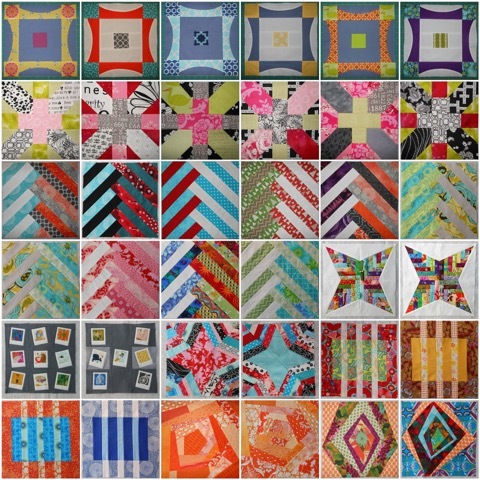 I didn't make an All-Solids quilt until 2014 which seems crazy since that is the majority of what I work in now. 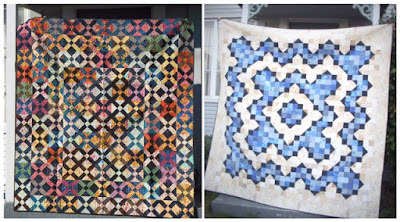 Capitola Crossing was directly inspired by an antique quilt, details blogged here. It was displayed at Amish: the Modern Muse, a juried exhibit representing three Modern Guilds in the FiberSpace section of the San Jose Museum of Quilt and Textiles. 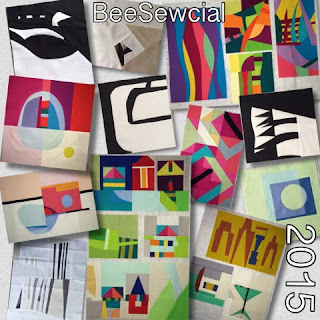 My style has expanded to include Improvisation with Meaning in the Make since joining BeeSewcial. 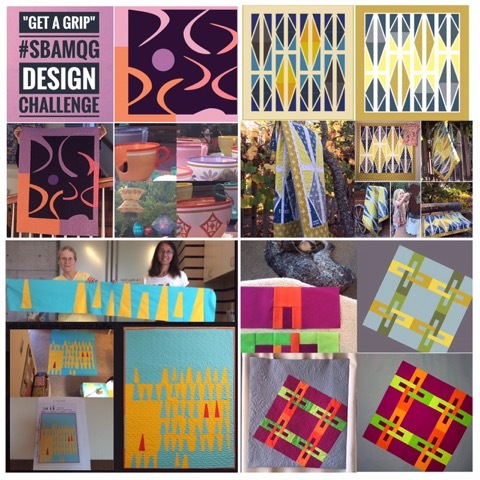 The Graphic and Minimalistic focus also comes from Quilt Design A Day, QDAD a Facebook group that I am admin for. Both encourage exploration and push me beyond boundaries more than I'd ever imagined. The transformation of a design mock up to a finished quilt is a process I highly recommend trying. Here are four samples: Two challenges for our local show, "Resonate" for the AGF Heartland Tour Blog Hop, and Castle in The Sand a collaborative quilt with valued mentor Pam Rocco. As you can see I've deviated from he original design but have captured the essence which is more my goal. 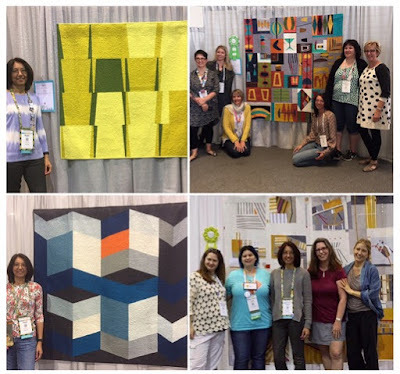 Contributing blocks for QuiltCon First Place group bee winners: 2016 Debbie Jeske's Mod Mood and 2017 Stephanie Ruyle's Direction Optional was such an honor. 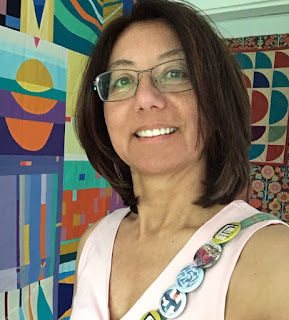 Fortunately I had the opportunity to be there to see the quilts up close in person and help celebrate. Thanks to the QDAD Showcase and Quilt of the Month Special Exhibit, my own quilts hung in Savannah at QuiltCon East. 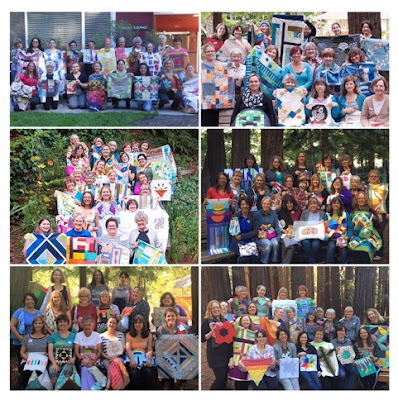 This year I'm going to enter my absoulutely stunning Reflections BeeSewcial quilt and hope, hope, hope it is accepted. Now that I've puzzled this one together I should have no trouble with the next two, right? I was diligent about documenting blocks back in the Flickr days and am sentimentally fond of them despite how different in style they are. 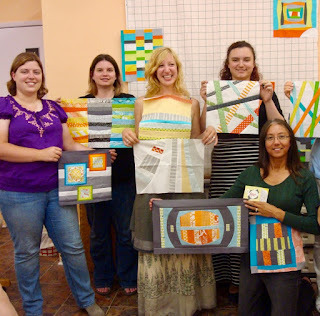 Quilting with friends is really special to me. Fortunately this happens on a regular basis with a small local group and annually with our guild. 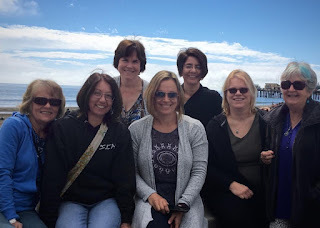 I've also managed to crash a couple of sister guild retreats too! 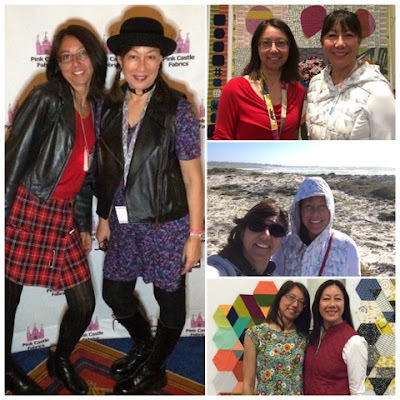 My wish is to have a larger Multi-Chapter or Regional sewing meet up, a casual no frills opportunity to hang out with nearby peeps that I "know" from social media someday. 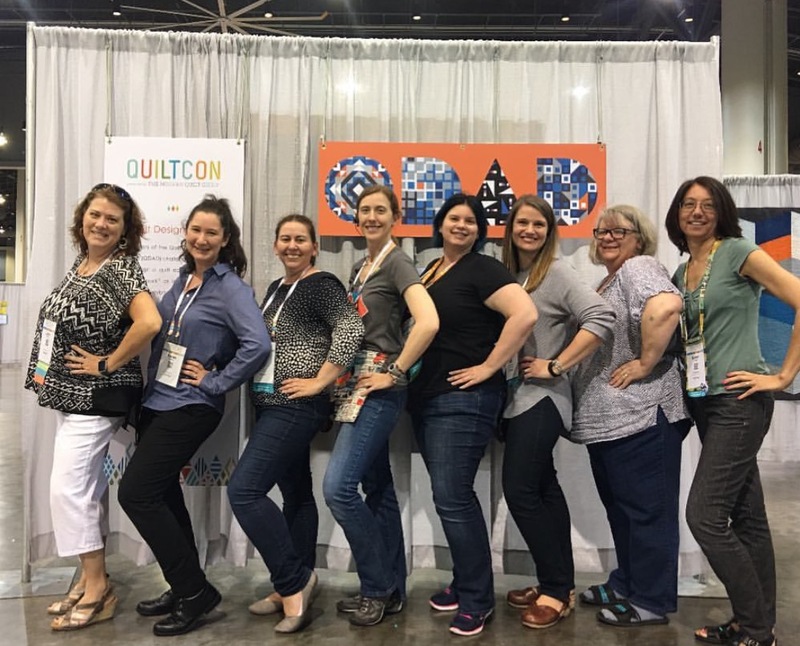 I'm also lucky to meet up with my sis who lives far away at quilty events like QuiltCon, Quilt Festival and Empty Spools. For the 90's themed party at Glamp Stitchalot we had fun dressing up and although my closet may still have authentic garments from the era, I repurposed a plaid blazer into a skirt. We'll be together at another QuiltCon in February - say "hi" if you see us. She'll be the one perfecting her skills in back to back workshops and I'll be the one striking up a conversation with a perfect stranger, embarrassing myself with fangirl selfies and sporting a blue volunteer t-shirt. Being part of our MQG guild chapter South Bay Area MQG from the beginning, serving as VP and chairing committees has made a huge impact. Learning from one another and being part of something bigger holds a special place in my heart. I never would have guessed the first tutorial as a brand new blogger, Polaroids Chain Pieced would generate the highest traffic to date and show up on tons of Pinterest boards. A special shout out to my blog followers! This summer I had the pleasure of teaching my first workshop, a technique and design rather than project based class. Students did great playing with parts and possibilities and their enthusiasm made for a fun time. I hope to have more opportunities in the future and am developing a spin off class that I'm excited about. 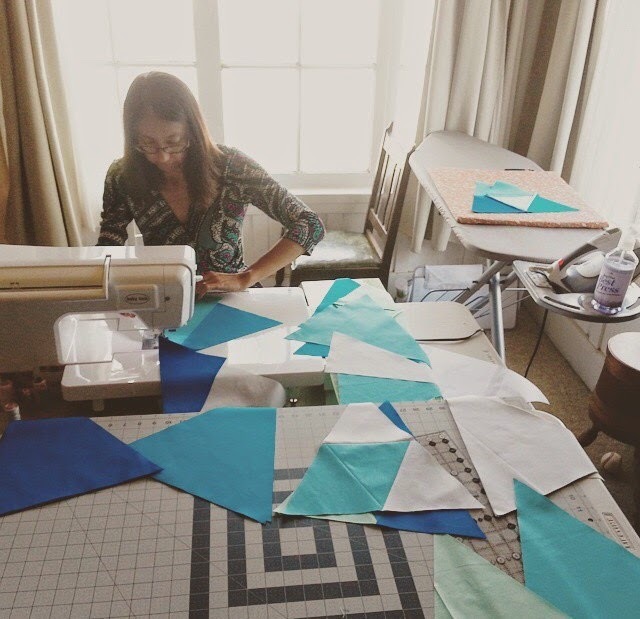 Once upon a time, I had an organized sewing space in a small L-shaped room of our house as a legit place to create. Yardage stored on comic boards in bookshelves and FQ-ish bundles kept in an antique cabinet with scrap tubs lining the perimeter of the ceiling on a shelf. Some weekends I would rarely step away and loose all track of time. It was all inclusive but a little lonely and cramped. To be more centrally located I temporarily put up a portable design wall, sewing and cutting table in the living room only I have never moved back. My old room is now a glorified closet, piled high with projects in buckets and bags waiting to be put back where they belong - or better yet, finished. When I get in the productive zone, I just push aside what's in my way or brush it to the floor and keep going. 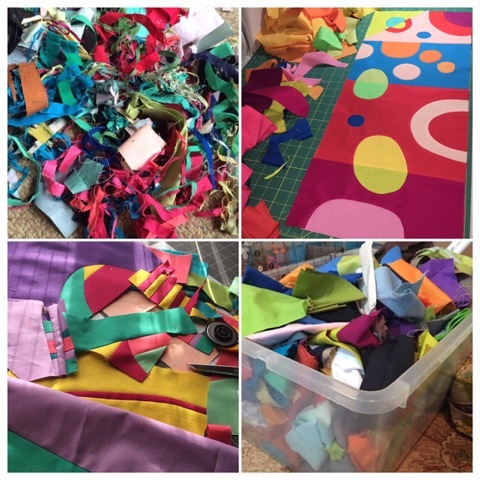 I may be sewing fewer scrappy quilts these days but I am certainly not making less scraps! Thanks for taking the time to learn more about me and the creative frenzy that has been my journey so far. I wish you all the best of luck with your FAL goals and hope you continue to carve out a quilty path that brings you joy.